Blurb has announced a new integration with the popular photography iPhone app, Instagram. Photographers will now be able to create 7x7 inch photo books directly from the app itself. Prices will start from £7 and can be made with a range of paper types and covers. Blurb is an online publishing service, allowing photographers to create, sell and market their own photobooks. The Blurb integration automatically increases the resolution of Instagram images, with Blurb claiming that this will ensure print quality images. The 7x7 inch format has been chosen to support the square Instagram images. Instagram is a free iPhone app which allows photographers to add filtered effects to their iPhone photos to give them a 'retro' feel. Filters include 'Earlybird', 'Toaster' and 'Nashville'. According to Instagram, the app has been downloaded by 3.75 million users. 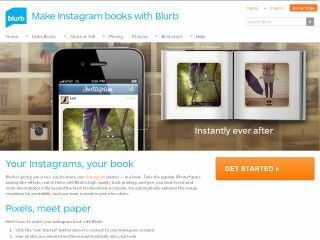 To make a book, users sign into their Instagram account on the Blurb website. The most popular image, based on the number of Instagram "likes", is added to the cover of the book. After that, the most recent photos are autoflowed into a book that can be previewed and purchased, or edited using Blurb's online bookmaking tool, Bookify, which gives full creative control to edit, personalise and customise your book. Photographers can choose from 3 cover types and 5 different paper types, making each Instagram Blurb book different. Once the book is created, users will have the option to share and sell their book from the Blurb.com bookstore. The Blurb bookstore allows users to market and sell books and keep 100% of the profit. More information can be found on the Blurb website.